I thought I would start a Friday series based around things I find on Pinterest. Hardly a unique idea I know but I know I have lots of things languishing on the many boards I have happening that I’ve been meaning to try but haven’t got around to! 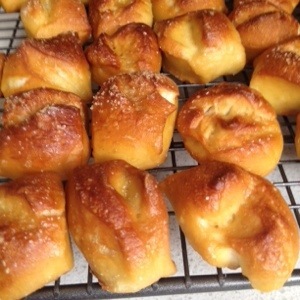 So this morning Mr 2, who loves nothing more than making a floury mess and using the electric mixer, and I made these mini pretzel bites via the awesomely named, I heart naptime. The verdict: they’re a bit of a fuss to make with the boiling and rolling etc but the recipe is perfect in terms of quantities. Also, for us who bake in Celsius the oven needs to be set to around 220 degrees. We all love pretzels at our house and I am going to package them up for after school and 3pm work day snacks. They would totally rock with a cheesey sauce but I’m not going that far! I would love to know what you’ve found and tried on Pinterest lately. Please do share!!! This entry was posted in food, lunchboxes, pinspired, recipes on March 14, 2014 by catbeloverly. I spend a lot of time in the kitchen. I really only found a joy for cooking when Mr and I first moved in together more years ago than I can remember now. When Bebito was born I began to focus more on making things from scratch. As much as I knew breast feeding would give him the best start I wanted his belly to be full of nutritious, tasty food. And he has rewarded me ten fold with his appreciation of what I set in front of him, his willingness to try new things. I never cook anything I don’t think he will enjoy eating. Little Lion can be hit and miss but I hope one day he too laps up all manner of different flavours. Mr too has an appreciation of good food. In giving my family good food I feel like I am giving them my love and care. But there’s more to why I spend so much time in the kitchen. I find it meditative. Especially so when I am able to potter on my own. It is a time to think too. To process my feelings, thoughts, dreams and hopes and after an afternoon of cooking I often find myself revived or more at peace. I often think how I am connected to the generations of women before me in my kitchen labours. Today I’ve baked a bunch of lunchbox items, dinner and some muesli. At the same time I’ve reflected on the news I heard earlier today of Charlotte Dawson. I know little of her, only that she was a woman who struggled with depression and she vigourously defended herself against online bullies. I also thought of the people in Kiev who are fighting – and dying – for what they believe in. For the asylum seekers on Manus Island who are trapped there, fleeing from horror only to be greeted with a different sort of horror – the horror of detention in limbo. And as I think of these people in their struggles I cannot help but wish that people could act with more kindness. Kindness. It’s such an easy place to start. And yet so many are not kind. Perhaps if everyone spent some time cooking for the people they care about, an act of service in which they put the needs of others before there own there could be more kindness? I actually used half of the pastry and froze the other half. Our local supermarkets don’t stock decent premade pastry and I make mine in batches, then freeze for another day. Grease a 30cm x 20cm pie or flan dish. Actually, any will do but just make sure you have enough pastry to cover your tin. Blind bake the pastry first – I did mine 10 minutes lined with baking paper and pastry weights then 10 minutes without. Make sure it’s quite golden as the top won’t get much cooking when you put the filling in … But not too golden. If you’re using puff pastry let it settle a bit and not be so puffed before you put the filling in. At the same time as your baking the pastry, place your sliced tomatoes on an oven tray and bake with a drizzle of olive oil over the top. Remove from oven and set aside. 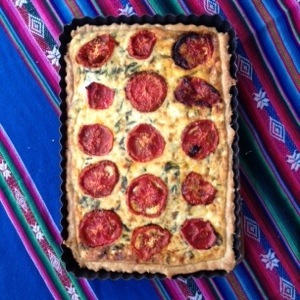 Pour filling ingredients over your pastry and top with the sliced tomatoes. Bake about 25 minutes, or until golden. We will be enjoying it with a rocket, nashi pear, walnut and balsamic vinegar salad tonight. Share with your loved ones for most enjoyment. This entry was posted in family, food, gratitude, mama-hood, recipes, things i'm learning, what I believe on February 22, 2014 by catbeloverly. Little Lion is going through a few weeks of super dooper fussy pants eating. Things he usually eats happily have been declared, “sgusting” (disgusting) and my patience for it is wearing very thin indeed. As I’m not sure how long he can live on home-made muesli and puffed corn I am veggie smuggling. Most Sunday mornings after breakfast, I do some baking and this morning I thought I’d try my hand a refined sugar free cake using some of the large number of zucchinis we have (pity I can’t make a tomato “cake” cos we have a heck of a lot of those from the garden too!). It’s a very moist cake indeed and the boys have devoured a row for morning tea. 1. Preheat oven to 180 degrees celsius, lightly grease a cake tin of your choice. I used a 22cm square dish. 2. Dice apple and cook until soft – I did mine in the microwave with a dash of water – and squish with the back of a fork or food processor type gadget to make a “sauce”. Frankly, I didn’t want to make too many dishes so I just roughly did it with a fork. 3. Add butter, honey, baking powder, baking soda and vanilla to a large bowl (or in your stand mixer if you like) mixing until a lovely cream has been formed. 4. Beat in eggs, one at a time, until incorporated. 5. Gently fold in flour, zucchini, apple, cacao and yoghurt to the butter mixture. If it isn’t looking quite cake-y enough do feel free to add a little more yoghurt. 6. Pour in to cake tin and bake for around 25 minutes, depending on the size of the tin you use. When tested, a cake skewer should come out pretty clean. 7. Leave to stand for 5 minutes, then invert to cool on a cake rack. These are going to be lunchbox fare for Bebito too and despite his initial hesitation – he spied the zucchini straight away – he loved it. 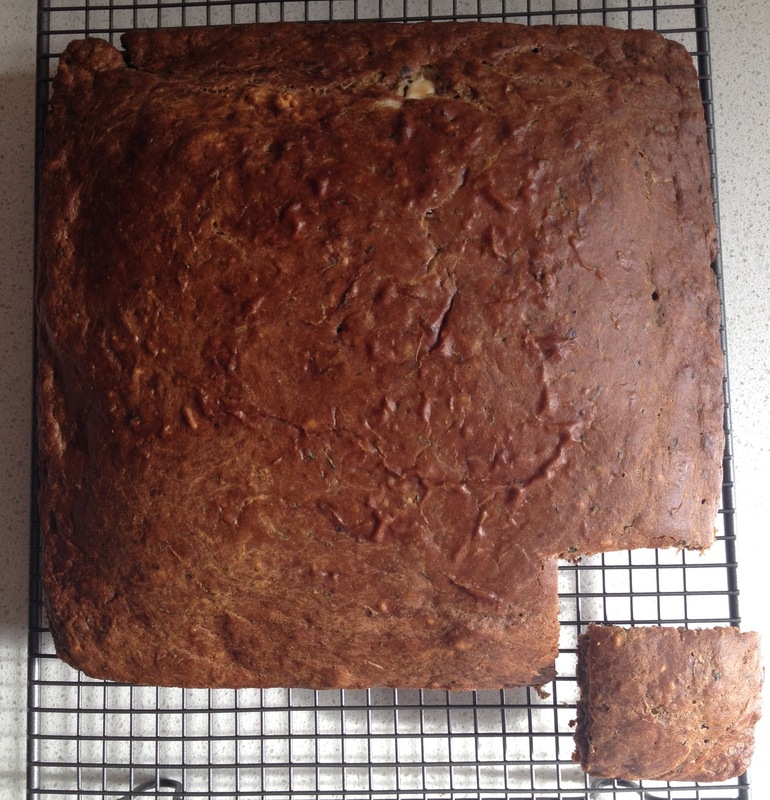 This entry was posted in family, food, lunchboxes, mama-hood, recipes on February 16, 2014 by catbeloverly. Over the last few weeks I’ve been stocking the freezer with lunchbox goodies in anticipation of Mr 5 starting school next week. His eating regime will be rather different, particularly the times he can eat compared to what he’s used to so I will be very interested to see how it all goes. My focus has been on healthy, low GI, high protein food. Ideally, I want things that will appeal to Mr 2 as well so that he eats a healthy diet. Unlike Mr 5, Mr 2 can be a really fickle eater so it’s him I really struggle with most of all, especially with protein. As is my usual style, I’ve overthought things – I came up with a master list of foods, in consultation with him, then allocated a “style” of meal – ie. pizza/scroll day is on Tuesday – and made a couple of versions of these types of things for him to choose from. I know from his days at preschool that he was more likely to eat his lunch if he has chosen it himself. 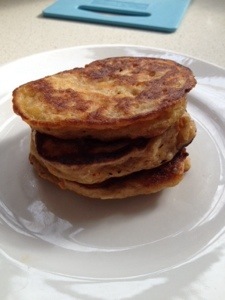 Last night I was playing around on Pinterest and came across these two really yummy looking recipes – carrot cake waffles and honey and oat pancakes so I combined the idea of both and made up some mini carrot pancakes. They are delicious and I think will make a perfect recess snack or even for breakfast! Mix flour, baking powder, carrots, oats and cinnamon in a bowl. Add vanilla, eggs, yoghurt, maple syrup to dry ingredients. Gently fold all ingredients together. It’ll be all lumpy which is a sign it’s going to be DELISH! Spoon tablespoons of the mixture into a fry pan over a low-medium heat with a little butter melted (I like the taste of pancakes cooked in butter but hey, if super healthy is your thing you could do the coconut oil or whatsoever you prefer). When bubbles form on the top and pop you know it’s ready to turn them over – it should take a couple of minutes for each side to cook them through. You could add sultanas, coconut, linseeds, chia seeds or anything at all that takes your fancy. This entry was posted in lunchboxes, recipes on January 23, 2014 by catbeloverly. I am obsessed with anything salted caramel – salty and sweet is just the best combination. In my search for great gifts for Christmas I wanted to try a simple, cost effective recipe we could give to extended family and work colleagues. I have “heard” that flavoured popcorn is the new macaron and I LOVE popcorn so my mind set to thinking! 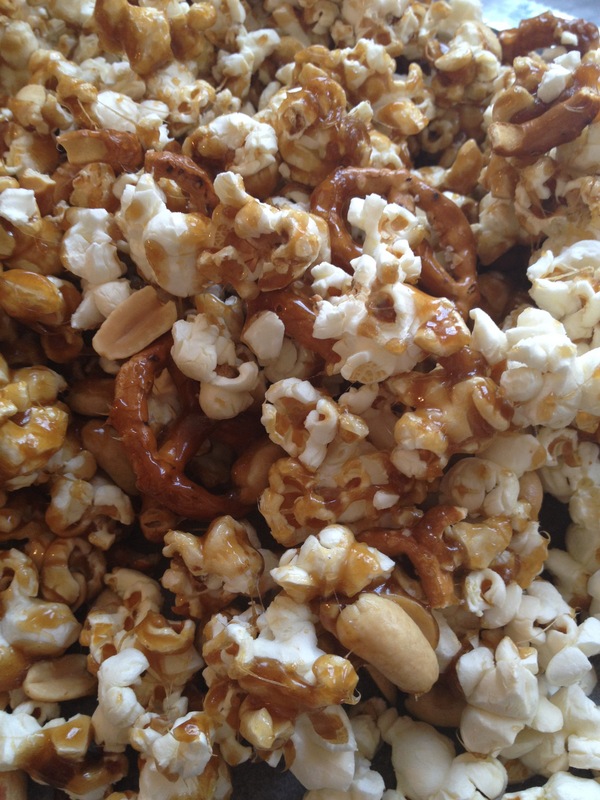 After some experimenting, I present to you my salted caramel popcorn with peanuts and pretzels….I apologise but it’s incredibly more-ish and if you try to just sneak a little taste the little taste will turn in to a big taste and you may end up skipping a proper meal in favour of this amazingly awesome sweet treat. 1 cup salted pretzels – I reckon the ones you buy at the Continental delis in big bags are better than the supermarket style ones but hey, I’m not that fussy! Pop corn in your preferred way and place on a lined baking tray so it’s all nice and flat – use two baking trays if you need. Sprinkle over your pretzels and peanuts. Melt butter in a saucepan over medium heat, adding sugar, water and salt and leaving to bubble away for around 10 – 12 minutes until you think it’s looking a lovely deep caramel colour. Don’t stir it but you can swish the pan around a little if you like. Stirring disrupts the awesome caramelisation of the mix and we don’t want to mess with that! Remove from the heat and whisk in the baking soda. Watch magic happen as it transforms in to a bubbling, golden lava. YUM! Be careful though cos it’ll burn you big time. Carefully pour it all over the popcorn mix and if you can, use a lightly oiled knife or spatula to give it all an even coverage. It’ll keep in an airtight container for at least a week, maybe more depending on how often you go in to sneak a piece! 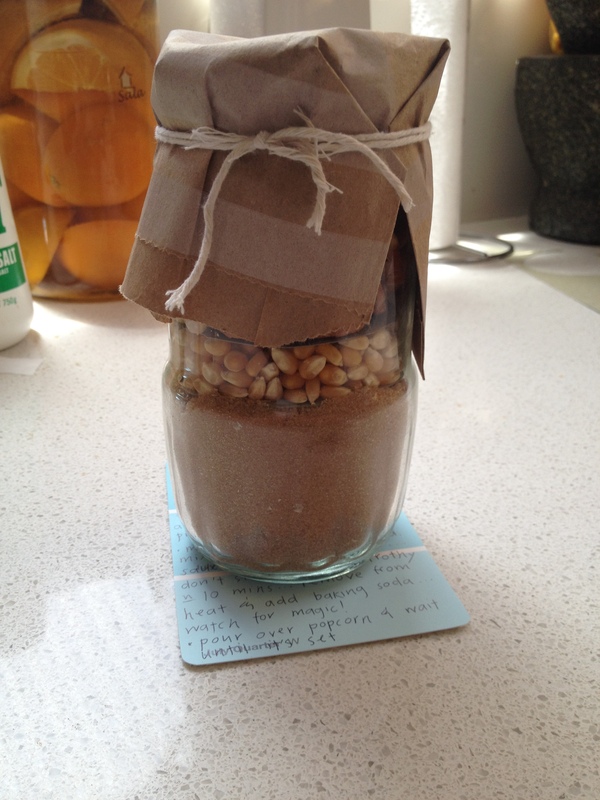 I also turned this into a DIY gift…packaging up the corn kernels, sugar, salt, bicarb soda (in a little pouch), pretzels and peanuts in a jar and topping it with a little paper bag so that the recipient could use the bag to eat the popcorn out of. I also used a paint swatch card to write up some instructions on what they should do to make up their popcorn. Are you mad about salty and sweet too? I’m going to experiment with some chilli and chocolate flavour next for the grown boys in my life who are partial to that kind of caper. What flavours would you like to try? This entry was posted in christmas, creative stuff, food, recipes on November 18, 2013 by catbeloverly. I’ve found that making lunchbox items for us all and freezing them one of the most time saving things for the days I’m working. It means a little bit of organising on weekends but it’s worth the effort. 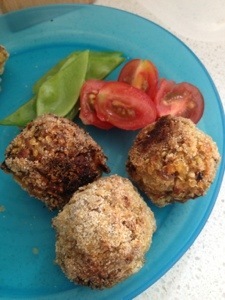 Today I made up these tuna, quinoa & tahini “bites” and they’re really delicious. Mix all the ingredients except semolina together. Form into small, tightly packed balls and roll to coat in the semolina. Place on a lined oven tray and slightly flatten to form patties. Bake for about 10 minutes until brown. Turn and bake them for another 10 minutes or until brown. Serve with some salad and some natural yoghurt to dip. This entry was posted in food, lunchboxes, recipes on September 8, 2013 by catbeloverly. I instagrammed this photo a few days ago, and my gorgeous kindred foodie friend Amy made the same meal yesterday and posted it on Instagram….she makes food look SO good so you should trust her photo rather than mine. It’s a dish from the latest SBS Feast magazine (issue 24) and is 1. easy 2. healthy and 3. delicious. WIN!!! Oh, and both my boys gobbled it up (though I didn’t add the coriander or spring onion to theirs) so a super big win. We are rather fond of our huge local Asian grocery store and have the majority of these ingredients on hand but if you don’t your local Asian grocer is bound to have them all. Place soy sauce, wine, sugar, garlic, ginger and 1L water in a saucepan over high heat and bring to the boil. Reduce heat to low, then add chicken and cook for 10 minutes or until cooked through. Remove from pan and allow to cool. When cool enough for you to handle shred with your fingers (I think it tastes better this way than when cut with a knife too but hey, each to their own). Set aside. Drain noodles and cook in a saucepan of boiling water for 2 minutes. Drain again, then place in a large bowl with sesame oil, tossing to combine. Add cucumbers, carrot, spring onionns and shredded chicken, tossing to combine. 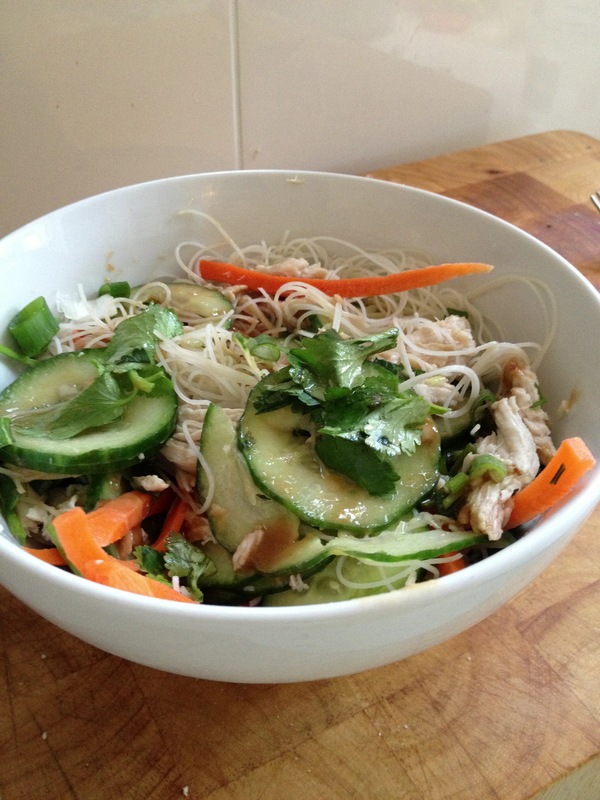 Divide among serving bowls/plates, drizzle with sesame dressing and serve scattered with chilli, coriander and peanuts. I actually totally forgot to add the peanuts and I think cashews would work just as well and I would add some toasted sesame seeds next time too. I also think any crunchy vegetable would be lovely in this dish – capsicum, snow peas, even lightly blanched green beans. I think this will become a staple at our house and will be especially popular in summer. This entry was posted in blogs i heart, family, food, recipes on August 27, 2013 by catbeloverly.